The government will dispatch a special envoy to Libya as part of efforts to rescue a South Korean man held captive by an unidentified armed group there, the Foreign Ministry said Wednesday. Foreign Minister Kang Kyung-wha will send Baik Joo-hyeon, a former ambassador to Kazakhstan with experience in resolving kidnapping cases involving South Korean nationals, to the North African country as soon as preparations are completed. He plans to stay there for two or three days. One South Korean national and three Filipinos were abducted from their work site in Jabal Hasouna in western Libya on July 6, according to the ministry. It remains unknown who the kidnappers are and what their demands are for the release of those abducted. The government said it is closely coordinating with the Libyan and Filipino governments. The dispatch of the envoy comes in the wake of “a change in situation” following the release of video footage showing the hostages crying for help, a Foreign Ministry official said without further elaboration. “We plan to dispatch the envoy for in-depth, specific consultations with the Libyan authorities to win the early release of the South Korean national, given the new situation,” the official said on condition of anonimity. The video clip was posted on the Facebook account of a major Libyan news outlet on July 31, prompting the South Korean government to go public with the abduction. The ministry had asked the Korean press to refrain from reporting the case as publicity could adversely affect the government’s efforts. The government has commissioned a risk management consulting firm for further analysis of where and how the video was recorded and released, according to the official. The video was uploaded in a third country by an unidentified online user. The official did not confirm whether the kidnappers had contacted the government and whether the kidnappers had been identified. He said the South Korean hostage seems to be in relatively good health. 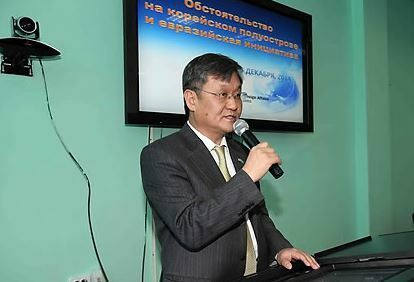 Baik, who served as the ministry’s director-general of the consular affairs bureau in the early 2010s, has extensive experience in rescuing South Korean nationals abducted abroad. He led rescue efforts in two cases involving South Korean fishermen abducted in waters near Somalia.